So Barack Obama wants to raise the federal minimum wage to $9.00 an hour from its current $7.25 level. Is this a good idea? Many bloggers and economists will argue that lower wages mean more jobs and that this relationship is mathematically fixed and a basic fact of economics. They will seek to paint a picture in which all serious or reasonable people agree that higher wages will hurt business or stifle growth. I intend to show their line of reasoning to be overly simplistic and to question this consensus. If we force firms to transfer money out of capital and into labor, then while the capital holds up it should be largely neutral. What will change is the composition of GDP; consumption will rise at the expense of capital investment. It does not follow that shifting money from capital to labour necessarily results in decreased investment; to argue such is an appeal to the long-debunked Say’s Law. Even were it true that shifting money from capital to labour moved money away from investment right now, if shifting money to labour succeeds in expanding demand, and the economy is suffering from a lack of demand, not a lack of supply, expanding that demand by augmenting the labour share and consumption is itself merely a different kind of investment. 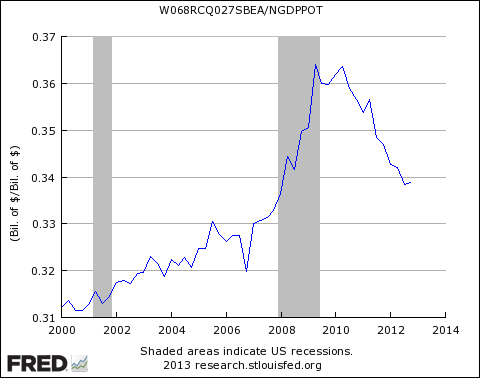 Empirically, it’s just not true–the US economy has historically performed much better when the wage share was higher. I should like to elaborate on these arguments in turn. Say’s Law states that all capital is invested or spent immediately. If you take money from a business to give to workers through a minimum wage, Say’s Law would indicate that this would result in a decrease in investment and, in the long run, a decrease in growth. No one ever sits on money, because sitting on money is irrational. The trouble is that Say’s Law is not true. 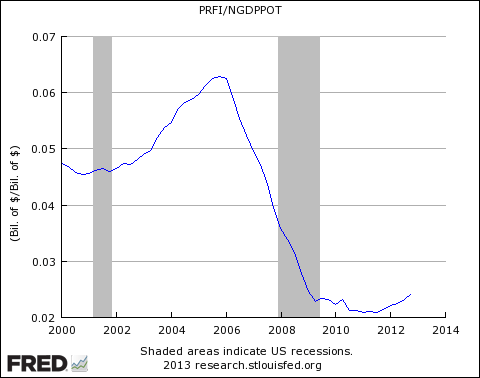 The data is from the Federal Reserve; I ran across the chart reading Paul Krugman. 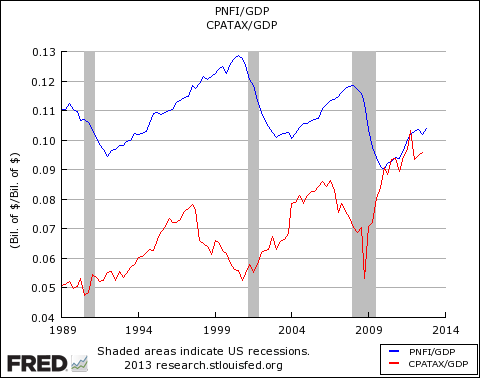 The blue line is non-residential fixed investment (broadly speaking, business investment); the red line is corporate profits. What we see is that while corporate profits are already substantially higher than they were before the recession, business investment remains significantly depressed below its pre-recession peak. If it were true that all corporate profits were invested, it would be nearly impossible for profits to rise without a corresponding rise in investment. This means that, in the current economy, many businesses have lots of money that they are not investing. This is perfectly rational on their part–if businesses invest in increasing their ability to supply the market with goods by hiring people, opening up new locations, buying new machinery and so on when there is no one wishing to buy more of what said businesses are selling, money is invested without any corresponding increase in business profits. The role of business is to make profit; a business that invests when investment is not profitable will not remain a business long. If a village buys 100 apples a day, and I, as the local apple farmer, decide to invest to increase the capacity of my apple farm from 100 apples to 200 apples, unless I have some reason to believe that the village will increase its consumption of my apples by a factor of 2 without requiring a corresponding downward shift in my prices, I am an extremely foolish apple farmer. What will very likely happen is that either many of my apples will go wasted on the shelves, or in order to sell all of my apples I shall have to reduce my prices such that there may be no additional profit (indeed, perhaps even bigger losses) than before. So this means that businesses are sitting on large piles of money, which they are wisely not investing, waiting for there to be some sign that if they invest, their investment will result in larger profits. One potential fix to this is to simply take some of the money these businesses are sitting on and give it to poor and working people through a minimum wage hike–the very solution being proposed. People at the bottom of the wage scale consume almost the entirety of their incomes. While they are unlikely to enter the housing market any time soon, added consumption elsewhere in the economy will make up for the continued lethargy in housing, raising consumption and so making it more profitable for businesses to invest what profits remain to them. It cannot possibly decrease investment in the short term to take profits that are not presently being invested and put them in the hands of people who will consume them. But even so, let’s move to the second argument–if this were to lead to a decrease in investment, that would still not pose a problem. The primary way I can see of sustaining an argument that a minimum wage hike still leads to decreased investment is to point out that when the economy does grow and the opportunity does present for businesses to invest at profit, they will be less capable of doing so because we will have taken money from them to give to workers through the hike. There are two things to observe here. The first is that this is probably to the good–if business has a large store of profits from years of under-investing, a sudden over-investment from business could result in inflation, new bubbles, and other examples of unhealthy, unsustainable growth. Our goal is not to maximise investment, it is to maximise growth–the wrong kinds of investments can create the very problems from which we are now trying to recover. The second is that there will not come a time in which it is profitable for businesses to invest until demand and consumption increase. If the money to spur this demand and consumption does not come from currently idle corporate profits, from whence will it come? There remains no willingness on the part of the state to pursue a serious policy of fiscal stimulus. With the federal funds rate sitting at its zero lower bound, there is little scope for additional stimulus on the monetary policy side of things. The added consumption is left to come from the private sector, but with all the private money locked up in idle profits, it can do nothing. It is not rational for any one business to invest those profits in increasing demand so as to make future profits worthwhile, but if all businesses together are made to do it through the law, through a minimum wage, all stand to gain and none to lose. We see an elevated wage share in the mid-80’s (Reagan’s morning in America) during which the economy performed better than it did both in the early eighties and in the late eighties when the wage share was lower. We see a wage share far higher in the 40’s, 50’s, and 60’s than it is presently, despite the comparative economic boom during those years against our slump. The careful reader will observe that there is a tendency for the wage share to go up during recessions–this is not to suggest that hikes in the wage share cause recessions, but that when business is bad (as it is during recessions), profits shrink at a faster rate than do wages and employment. The corresponding fall in the wage share right after a recession ends reflects an increase in profits that is not immediately counterbalanced by wage and employment hikes. Bearing all this in mind, there are many good reasons to think that the conventional wisdom on the minimum wage is not especially wise, particularly given the current economic circumstances of slumping investment in the face of high profits. The modelling on the minimum wage that leads to the view that wages hikes are bad for the economy is only true insofar as its assumptions hold. While its assumptions may be close enough to true not to produce a large deviance between the model and reality in boom times, in times in which much of corporate profit goes idle, the assumptions underlying the model do not hold, and so the model itself ceases to hold. In sum, in a depressed economy, different rules apply. Those who recognise the differences and abide by them will do much better than those who recycle the plays run in regular times. Enjoyed the piece. There are two other aspects of the issue of min. wage increase that I think are interesting. According to some (Tyler Cowen), Say’s Law lives on despite the depressed business investments; specifically in the form of bank deposits, T-bill purchases, etc. In other words, rather than pay people a livable wage, we should rely on businesses to deposit their profits in the banks, who will then turn around and loan that money to labor (consumers) with interest. Also, I am loving how the GOP is going ballistic that min. wage+ will equal inflation. The EPI is low, as is the CPI, and despite an increase in the monetary base, money velocity is so low that some are wondering if the fed could actually hit 2% inflation for the next four quarters. Thank you, glad you enjoyed it. Interesting thoughts as well. The inflation scaremongering has been going on for years–the right never properly understood how stagflation happened in the first place and has translated that ignorance into a consistent belief that low interest rates, QE, state spending, anything that they find objectionable (and usually for other, unrelated reasons) will prove inflationary. Of course, given that we’re in a liquidity trap in which the federal funds rate sits at the zero lower bound with no resultant boom in employment or growth, the idea that a minimum wage hike would be inflationary is economic nonsense. Thanks for linking this way, Rick–I’ll read and respond (unless of course, I am convinced). This too, I shall consider.